On Friday, my friend Earnie and I headed to Artist Point near the Mt. Baker Ski area east of Bellingham, Wash. We started late as I had to complete a football assignment for the Bellingham Herald. We did not leave Bellingham until about 11. Our original plan was to shoot an expected display of the Aurora Borealis. However, Mother Nature decided to change its mind and send clouds to the north of us. Scratch one night of shooting the aurora. 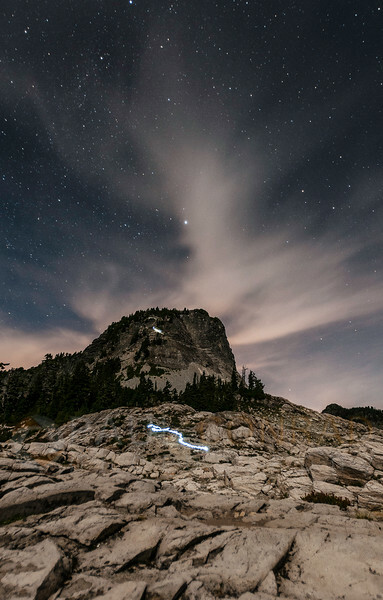 © Paul Conrad/Pablo Conrad Photography – Hikers light the trail with their headlamps as they walk down Table Mountain at Artist Point in the Mt. Baker-Snoqualime National Forest in western Whatcom County. east of Bellingham, Wash. This was a 30 second exposure at f/2.8, ISO 200. This reminded me of one of Galen Rowell’s photographs. 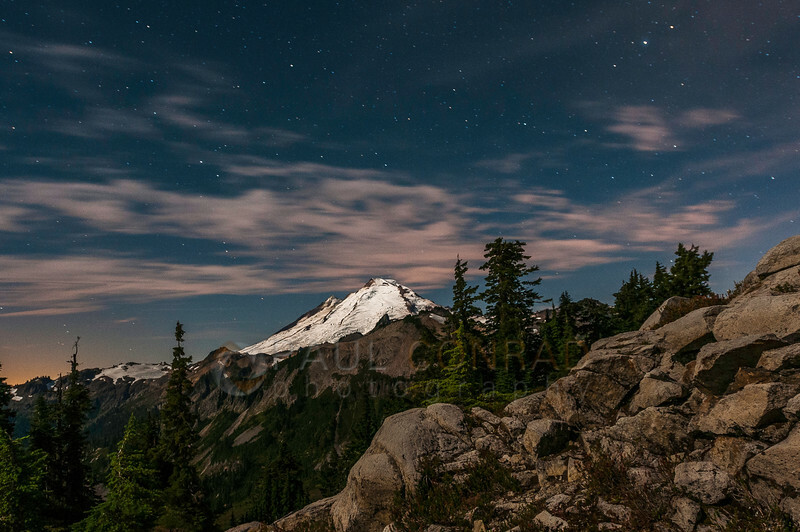 Rather than just say “Oh Well” and go back, we decided to stay and shoot star trails over Mt. Baker and Mt. Shuksan. The Moon was in the waning gibbous phase so the light it provided was really good, yet you were able to see stars. The surrounding mountains were gorgeous. The headlamps of hikers looked cool in long exposures. Overall, it was actually a good night to be photographing landscapes with starry skies. For all these shots, I used my Nikon D300s at ISO 200 with my 17-35 f/2.8 attached. I used the lower ISO to have better control over the noise. In a previous blog posting i tested my D300s at shutters of 2 and 4 minutes. You can see the results on this post: Long Exposure at Locust Beach . The only real issue was focus. As I was shooting at f/2.8 and f/4 to get as many stars as I can, proper focus was critical. And for the first 20 minutes, every single frame was out of focus. I bumped the focus ring. © Paul Conrad/Pablo Conrad Photography – Mt. Baker lit by a half-Moon at Artist Point in the Mt. Baker-Snoqualime National Forest in western Whatcom County, east of Bellingham, Wash. ISO 800, f/2,8 at 8 seconds. One of the first images I shot. After fixing that issue and with my eyes being adjusted for the dark, I began to see shapes, patterns, and compositions. So I worked every angle I could see. I watched the clouds move over. At one point, I watched as hikers came down from Table Mountain, their headlamps creating a worm of light as they descended. With that and the clouds forming leading lines, I shot a few frames. The result is the first photo. 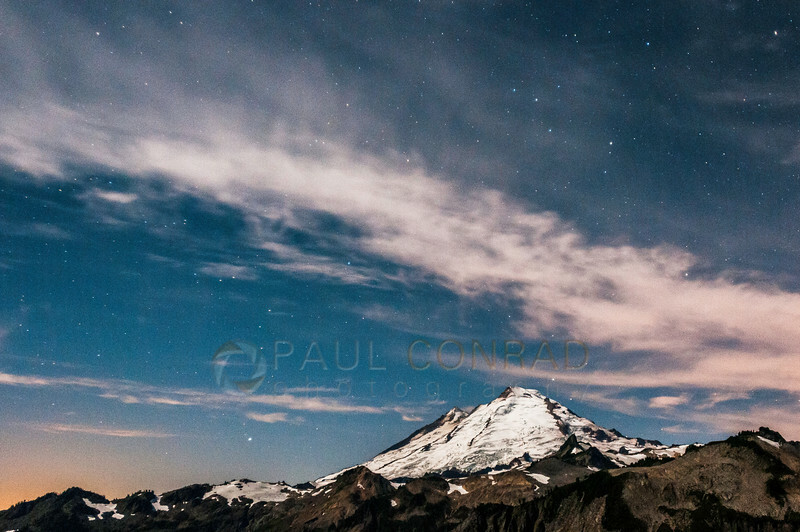 © Paul Conrad/Pablo Conrad Photography – Mt. 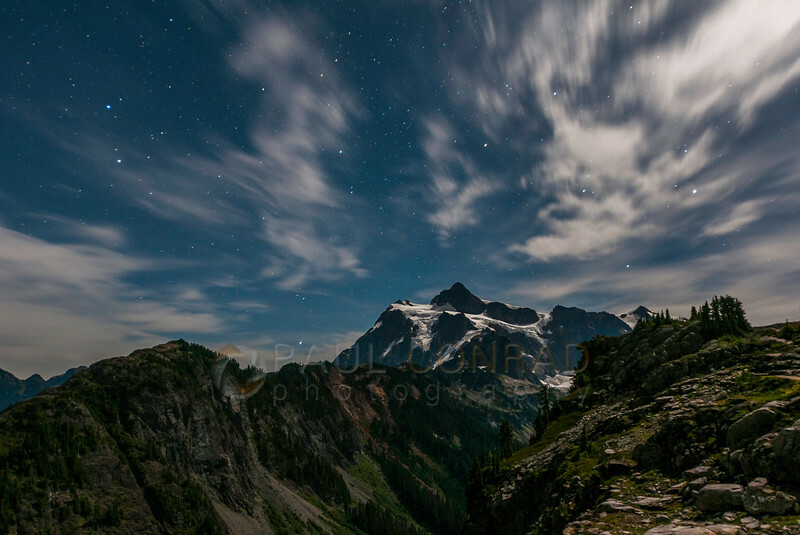 Shuksan is bathed in moonlgitht as stars leave trails as seen from Artist Point in the Mt. Baker-Snoqualime National Forest in western Whatcom County east of Bellingham, Wash. This is my favorite shot. Bake and Shuksan, pictured, are quickly becoming my favorites. ISO 200, 30 seconds at f/2,8. I wasn’t content with what I was shooting, so Earnie and I hiked along the east trail along Kulshan Ridge. This was fairly easy as it was a well-travelled trail and very easily seen in the dark. It also helps to have a nice headlamp. I use the Petzl Tactikka Plus headlamp with a flip-up red filter. The red filter lights the way yet preserves your night vision. Red is used because your eyes are not that sensitive to that wavelength. I bought this headlamp over 8 years ago and still works like a charm. As I walked along, I wanted a nice overview of Shuksan. In all, my fitbit said I walked nearly 5 miles that night. Not too bad. When focussing at night, find a distant and bright object to focus on. Turn off your headlamp and the look through the viewfinder to compose. Begin at 15 seconds at f/4 and decide from there what exposure you like best. Don’t worry if the first few times you don’t get anything decent. Afterall, you are learning and you will make mistakes. Hell, I still make them. 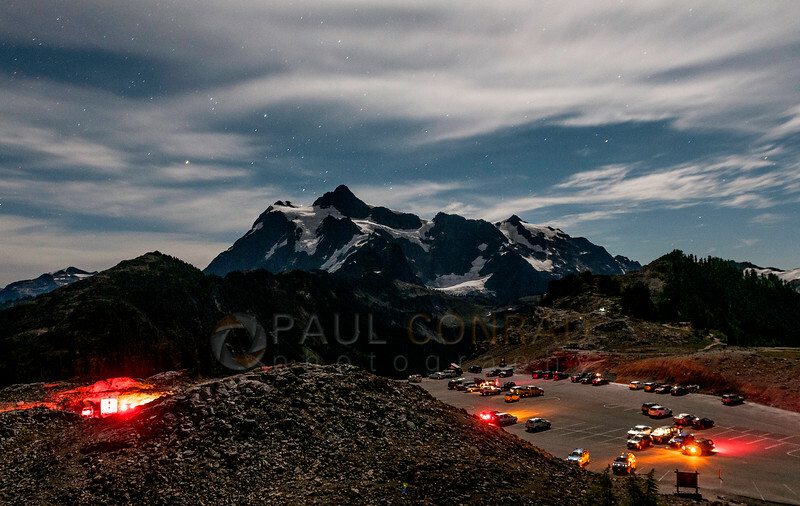 Paul Conrad is an award winning, nationally and internationally published freelance photographer living in Bellingham, Wash., in the Pacific Northwest. His work has been published in newspapers and magazine throughout the United States and in Europe. His specialty is photojournalism covering news, sports, and editorial portraits, he also is skilled in family portraiture, high school senior portraits, and weddings. He is available for assignments. Well captured shots, Pablo. You always manage to inspire me to shoot new things. Thank you Bronson. Hope you are doing well. Happy to hear I can inspire you to go out and shoot new things.